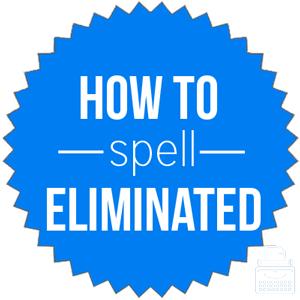 Spelling of eliminated: eliminated is spelled e-l-i-m-i-n-a-t-e-d. Once broken down into its five syllables, the spelling is fairly straightforward. Definition of eliminated: Describes something or someone that has been deleted, removed, or sent away. Pronunciation of eliminated: Eliminated is pronounced e-lim-in-a-ted. Eliminated is the past tense form of the verb eliminate. It can be used to describe an individual or team who has/have been removed from a competition. England has been eliminated from the soccer World Cup. It can describe something that is no longer under consideration. The president selected Plan A after eliminating all other options. It can also describe something that has been removed or ended. After appointing a new coach, the tennis player has eliminated her weaknesses. Finally, it can be used in the field of mathematics. The unknown quantity was eliminated when the student combined the equations. I have eliminated all of my enemies. Eliminated is the past tense form of eliminate. It is used to describe something that has been deleted and no longer exists. Eliminate is commonly used when a team or individual has been removed from a form of competition.